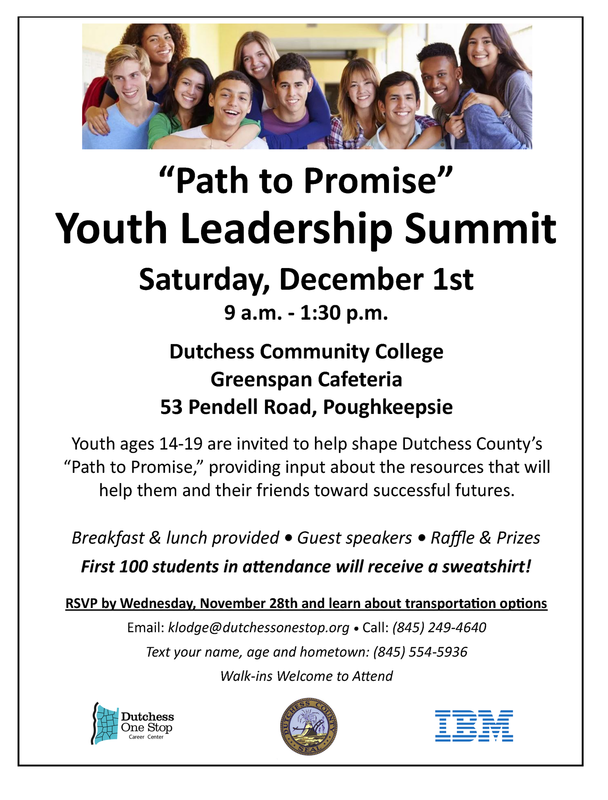 Poughkeepsie … Dutchess County Executive Marcus J. Molinaro invites residents ages 14-19 to attend Dutchess County’s “Path to Promise” Youth Leadership Summit on Saturday, December 1st, from 9 a.m. to 1:30 p.m. at Dutchess Community College (DCC). The event will give youth throughout Dutchess County the opportunity to review a draft of the County’s “Path to Promise,” a comprehensive plan to identify local community resources that youth need to be successful, to address any gaps in services or programs that may exist, and to shape the plan’s implementation. Attendees will evaluate the “Path to Promise” and give their input, helping guide the process that will benefit countless County youths moving forward. To be held in DCC’s Greenspan Cafeteria, the summit is the culmination of more than a year of research, planning and development on the “Path to Promise” by the Dutchess County Department of Community and Family Services (DCFS) and its contracted consultant, nationally recognized industry expert Public Consulting Group (PCG). Youth can reserve their spot at the free summit and learn about transportation options by emailingklodge@dutchessonestop.org, calling (845) 249-4640, or texting their name, age and hometown to (845) 554-5936. Breakfast and lunch will be provided, and the first 100 in attendance will receive a “Path to Promise” sweatshirt. Financial support for the Youth Leadership Summit is provided by IBM. Attendees will interact with a panel of youth-oriented guest speakers, who will discuss their road to success; they’ll separate into break-out groups to share their thoughts about the “Path to Promise;” and they’ll report back to the full group and give their findings to help organizers shape the plan and its implementation. For those unable to attend the summit, there will still be an opportunity to provide input. Dutchess County, along with Public Consulting Group (PCG) is seeking youth, parents and caregivers to participate in an online questionnaire; participation is completely voluntary. The summit is the County’s latest outreach to youth about the Path to Promise. This past spring, for example, the County hosted several focus groups at various sites in numerous regions of Dutchess County – each site offered individual sessions for youth, parents and stakeholders – discussing the “Path to Promise” and soliciting community input. Trained volunteers have visited seventh-grade social studies classes and 12th-grade Participation in Government classes in local school districts throughout Dutchess County to talk about the initiative with students. During Phase I of the “Path to Promise,” PCG examined and analyzed how youth services are provided within Dutchess County, looking at services provided directly by Dutchess County Government, as well as services provided throughout the community by various organizations and agencies. As part of the assessment, all youth services provided by Dutchess County Government were reviewed, including organizational charts, budgets, performance or outcome reports, and interviews with personnel from the various departments who provide youth services, including the departments of Behavioral and Community Health, Probation and Community Corrections, Planning and Development, and DCFS. PCG examined how the departments share information and collaborate, identify strengths and weaknesses in the current system, as well as duplication or gaps in services. PCG also performed a similar assessment of community-based youth services, with the goal of providing a detailed picture of the area’s youth services, identifying service delivery gaps and highlighting opportunities for increased alignment and collaboration between services. The research and analysis, done with a breakdown of services for various age groups from infancy to early adulthood, has culminated in this specific, outcome-based action plan – the “Path to Promise” – focused on developmental assets to ensure linkages are created in the services available from one age group to the next, as well as inclusion for youth with special needs. The action plan includes tools to measure outcomes and success, and will be critical in guiding future youth initiatives.